I hope you all had a wonderful Thanksgiving. I got to do it twice. Thursday I spent the day with my mom and dad and dinner with them since hubby had work. We had a great day together, then Friday, while the masses were out shopping til they dropped, I cooked a complete turkey dinner for my husband so he could enjoy a Thanksgiving dinner. Wow, is it me or is Christmas coming at full speed ahead or what? Did you realize Christmas will be here in 28 days? Yep, that’s right, 28 days until Santa and his eight Reindeer arrive bearing all those gifts. Will you be ready? I’m working on it. Today, I have a quick and easy gift card holder for you. Yes, really, you can whip up a dozen of these in no time. Start with a medium Whisper White envelope and score it down the middle. It is in the right side you will slip your gift card. 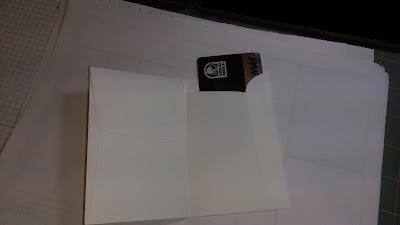 You will then need a 2 ¾”x5 ¼” piece of Designer Series Paper. I used paper from the Merry Moments Designer Paper Pack, but you can use whatever paper you like. Now adhere that to the front of the envelope turned gift card holder. Using a scrap of Whisper White cardstock I stamped the Christmas Image from the Among the Branches stamp set using Cherry Cobbler Ink and punched the image out with the 2” circle punch and punched out a scrap piece of Crumb Cake using the 2 3/8” scalloped circle punch and adhered the two together. I then wrapped a 16” piece of Cherry Cobbler ribbon (retired) around the card holder and tied it into a ribbon off to the side and placed the punched image over the ribbon using 2 Dimentionals straddling over the ribbon. There you have it, a quick and easy gift card holder. Change up the images and the paper and ribbon for a completely different look. How about for a birthday? Lots of ideas and options. Go ahead and give it a try. Thank you for stopping by. Please leave a comment and let me know you were here and what your thoughts are. Happy Stamping!